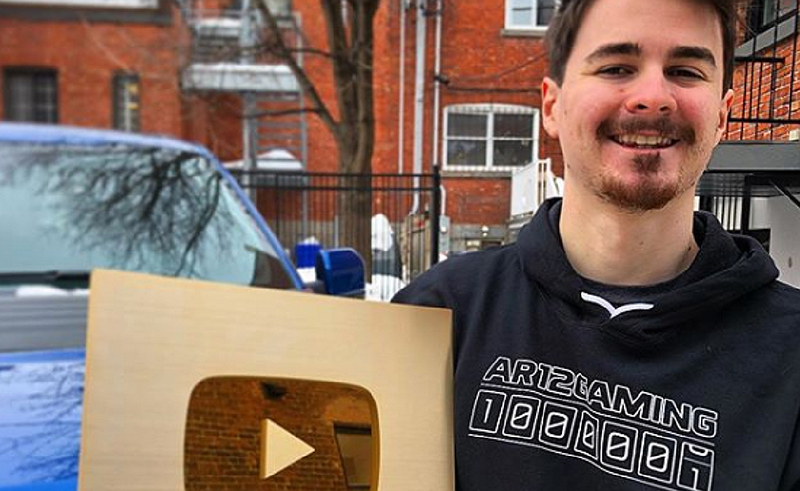 YouTube Millionaires: AR12Gaming Started Sharing His Love For Racecar Games On YouTube In 2012. Now, His Company Sponsors Real-Life Racers. Nick Andrew can push a car up to 280 miles per hour, drift around the tightest corner, and weave through oncoming traffic with only the occasional world-shattering wreck. We’re not talking real-world hairpin turns and highways here; we’re talking the in-game streets of installments in the Forza game series. Andrew, aka AR12Gaming, has been uploading Forza videos on YouTube since 2012, giving viewers a glimpse of what it’s like to drive the series’ sweetest rides. The latest installment to the series, Forza Horizon 4, has more than 500 cars for players to snap up and trick out, and Andrew regularly uploads one video per day profiling the game’s cars and what they’re capable of. Andrew has also expanded his YouTube moniker beyond YouTube. At 23, he’s the CEO of AR12Gaming.com, a gaming news site that has a number of big-name sponsors and primarily covers Forza. The company is also a sponsor itself: it recently signed a deal to renew its partnership and continue sponsoring real-world driver Ian Phillips, who competes in the British Drift Championship with AR12Gaming’s logo on his car’s rear spoiler. And for Andrew, renewing that sponsorship is just the beginning to what’s shaping up to be his biggest year yet. Tubefilter: How does it feel to hit one million subscribers? What do you have to say to your fans? Nick Andrew: I could have never imagined that one day I’d reach this point. Reaching one million subscribers wasn’t even a dream when I first started making content. Throughout the years, I never focused on the number of subscribers too much until one million actually became a possibility. It still doesn’t really feel real, and still sounds crazy when I tell people what I do. I really can’t thank the fans enough for sticking with me and my silly antics for so long. I get messages to this day saying “I’ve been watching for years and years,” and it’s so awesome to have so many people come on this crazy journey with me. Tubefilter: Tell us a little about your background! How did you get into gaming? What made you decide to start a YouTube channel? NA: I’ve been gaming since day one. When I was little, I always had my little old Gameboy on me or was back at home playing on the PC or GameCube. I never actually jumped into the racing genre until much later in life. My early gaming days were filled with plenty of Pokemon, or — since I’m a Canadian guy — NHL. Starting a YouTube channel was kind of an accident, honestly. One Christmas more than 10 years back, I got given a laptop with a webcam and Windows Movie Maker. Within a week of getting it and procrastinating doing homework, I set up a channel, recorded a video, uploaded it, and I was hooked. Since then, I’ve never stopped making content and loving every minute of it. Tubefilter: What do you think makes your content stand out despite all the noise on YouTube? NA: You often hear people say to make content you enjoy and just have fun with it, and that’s exactly what I try to do. I often try to push the envelope of what’s possible or what people think might be impossible, and then we do exactly that. Tubefilter: You’re a longtime Forza player. What draws you to Forza games—what’s kept you playing them for so long? NA: I actually haven’t been playing Forza for that long compared to some members in the community. I picked it up at the third iteration of the game because one of my friends knew I liked cars during high school. Since then, I’ve been hooked. The main draw to me is the extensive car list, the customization options to make your car look and drive the way you want, and the physics in the game. Combine that with the constant updates to the game, new content, and online community, and I don’t see myself stopping playing them any time soon. Tubefilter: Your videos often spotlight sweet moves or specific cars in Forza. How do you decide what cars to feature? Do you ever consider audience input? NA: Haha, I like this question. As I’m sure is the way with other channels in different genres, audience input is always greatly helpful and appreciated. In the latest Forza game, there are over 500 cars now, and I obviously haven’t driven them all, so when I start getting a bunch of messages from viewers to check out this car or that car, I jump in to see what’s going on. I also love to check out the latest and greatest cars that have either just released in real life or are brand new additions for the game to give my thoughts. Having said all of that, though, a lot of it is just what mood I’m in at the time. One day I might feel like building the fastest racecar I can, while another day I might feel like building the cheapest car I can to go drifting. Tubefilter: What’s your production schedule like? How often do you film? Do you have a set upload schedule? How long does it take you to film/edit your average video? NA: I don’t really have a set production schedule like other creators would. I can’t really commit to a day of filming or editing when a game publisher might be dropping news or a new update. There are some great publishers out there like the awesome people at Need for Speed, who keep us up to date on everything so we can be a part of the process and be aware of what is coming when. Other publishers keep us in the dark completely, which screws up our schedules massively. Sadly, it’s just out of our control, and it’s something we need to be able to react to when there’s new content to cover. As much as I’d like to be in the know for as many new games as I can, I understand why that isn’t possible. Tubefilter: Do you consider YouTube your full-time job? What else do you get up to in your daily life? NA: As crazy as it does sound, YouTube is my full-time job. Not to say that’s all that I do — I livestream on Twitch, sell merchandise, and even own a gaming news website called AR12Gaming.com. Away from content creation, I just do pretty normal stuff like playing sports, going to the gym, cooking, and watching Netflix. Nothing too crazy or exciting. Tubefilter: What’s your favorite part of making content specifically for YouTube? NA: My favourite part is just the ability to have fun while working. I feel so blessed to be able to sit down every day, play video games, and create content for people. I get a lot of messages from viewers telling me how they’ve been going through a situation and have watched my videos to make them feel better or to distract them from whatever might be going on. That alone makes all the work I do immediately worth it. Tubefilter: What’s next for your channel? Any plans looking to the future? NA: Of course! I’m always working on stuff behind the scenes, whether that be launching new shows, websites, or projects completely aside from content creation. We’ll see what happens in the future — 2019 should be a great year. Andrew is a Fullscreen client. You can add yourself to the ranks of Andrew’s more-than-a-million YouTube subscribers at his channel YouTube.com/AR12Gaming.